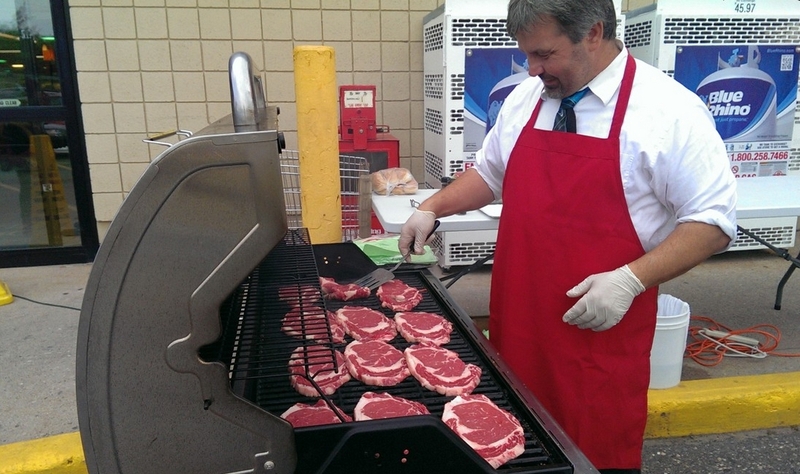 Marquette – July 3, 2015 – I love grilling in Marquette. I just enjoyed Super One of Marquette grillin’ steaks on the sidewalk and donating all proceeds to the Janzen House of Marquette. We cooked with propane this morning so here’s some more Grillin’ tips from the Propane folks to be safe this 4th. Its about that time to put up Old Glory, get the grill ready, and celebrate America’s Independence. But to keep the fireworks in the sky instead of under the grill, here are a few safety tips, zany recipes, and locally grown produce markets to keep you and your family safe and satisfied. Before you start grilling for the season, make sure your grill tank is in working order. Complete a simple visual inspection to your grill tank. bent on the tank’s foot ring, collar and valve cover; and there’s a working Overfill Prevention Device, or OPD. Your grill tank is good for the first 12 years but then needs to be re-certified every 5 years. Follow Instructions. Put your new grill together or clean your old grill by following the manufacturer’s instructions. The instructions will prevent issues later on. Keep It Outdoors. Your grill should be at least 5 feet from your house on a level surface that is away from siding, outdoor furniture, overhead trees, or anything else that could be a fire hazard. And, never store propane tanks inside. Not even in your garage or shed. Lighting and Relighting. When it’s time to light your grill, always follow the manufacturers instructions. But no matter what propane grill you have, make sure you keep the grill open and don’t lean over the grill when lighting it. If it’s windy and your flame goes out, turn off the gas and again refer to your owner’s manual. At a minimum, the National Fire Protection Association recommends you turn off the gas, keep the lid open and wait at least 15 minutes before relighting. Be Present When Grilling. Don’t go wondering off and leave the grill unattended. Stay at the grill at all times. And do not allow children next to the grill. With a number of new specialty farms popping up in Michigan, there’s now over 300 varieties of food and commodities to choose from. A great way to celebrate the holiday is to buy local. Grapes are delicious when served many different ways, but throw a bunch onto the grill and cook for four or five minutes, turning occasionally, and you have a delicious twist on an classic. Peaches are another food grown in Michigan that can also be thrown onto your propane powered grill when you feel like trying something new. Cut the peach in half and rub with butter. Place the buttered side against the grill and close the lid, allowing about four minutes or until softened or charred, flipping occasionally. Plums are always a summer favorite, but throw one on the grill and you have a surprisingly savory cookout side dish. Just cut the plum in half, brush with oil, followed by a mixture of honey and cinnamon. Grill for two minutes cut side down, and then turn over and cook for another minute. Eat it alone or add yogurt for a sweet and healthy alternative to the standard grilling classics. Asparagus is another Michigan grown food you can grill. Simply coat it with olive oil, season to taste, and grill over high heat for 2-3 minutes. With a sharp knife, carefully remove a 1 inch core from the center of each onion. The cut each onion into four wedges, and place in a bowl of double layered tin foil. Place bouillon in the centers of the onions, top with butter, thyme, salt and pepper, and drizzle with wine is you would like. Fold the foil around the onions, leaving a slight opening at the top, and grill over medium heat for 40 minutes.